For the second year, the sandwiches will get a limited release. 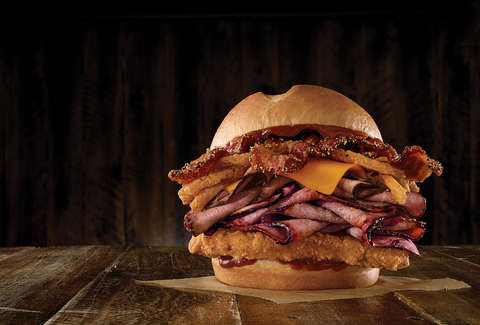 Though, this year there are a couple new additions, including a BBQ crispy chicken sandwich version. Also, there's the 910-calorie Triple Stack, which is just all the available meats piled between buns. The Triple Stack comes with buttermilk chicken, brisket, steak, and bacon. It's pretty much two meals worth of calories once you add in the curly fries you're legally obligated to order. It makes KFC's Double Down (RIP) look like thinly sliced deli meat. If you aren't looking for a jaw-buster, the other Bourbon BBQ sandwiches feature each of the Triple Stack meats separately. There's smoked brisket, Angus steak, or a crispy buttermilk chicken filet. All the sandwiches are topped with brown sugar bacon, crispy onion strings, cheddar cheese, and a Kentucky Bourbon BBQ sauce made with bourbon, cider vinegar, tomato paste, brown sugar, mustard, and Worcestershire sauce. Arby's hasn't announced a specific end date, but all the sandwiches, as well as the just-released Orange Cream Milkshake, will only be available for a limited time.